You'll never take your shoes off on a plane again. Whether you’re a frequent or once-every-10-years flier, some aspects of flying are universal. You’re probably uncomfortable, possibly dehydrated, and the person next to you is hogging the armrest. But how much do you really know about your experience? From how dirty the plane really is to the real reason behind delays, flight attendants share ten things that will alter your perception of air travel—for better or worse. 1. Gate agents have more power than you realize. While you’re waiting in the boarding area, gate agents are watching for anything suspicious and keeping an eye out for any drunk passengers; they can deny someone boarding for appearing intoxicated. They have power over your seat too: It doesn’t happen regularly, but if you’re overly demanding or rude to a gate agent, they could decide to give you a bad seat. If you fought with a gate agent over a carry-on and then you’re informed your seat has been changed from a 14A window to a 38B middle, that’s probably why. 2. Flight attendants don’t start getting paid until the plane leaves the gate, so they hate delays even more than you. Although they “clock in” when they arrive at the airport, flight attendants don’t start getting paid until the airplane door is shut and the plane pulls away from the gate. That means when passengers fight about carry-on luggage or ask for a cup of water in the middle of boarding, flight attendants are dealing with it for free. That also means when a flight is delayed and you’re sitting in the airport for hours, flight attendants are too, not making bank. 3. Most things on the plane are cleaned way less often than you think. Take your cues from what flight attendants do. You probably won’t see a flight attendant drinking airplane coffee—they opt for bottled water and get their coffee or tea before the flight, as the hot water used to brew it comes from a tank on the plane, whose cleaning frequency even flight attendants don’t know. If you do take a cup, know that tray tables are rarely sanitized, despite the fact that they’re used as headrests, footrests, baby changing tables, food trays, used tissue storage, and fingernail clipping stations. Bring disinfecting wipes. And there’s a reason all flight attendants cringe when you walk into the bathroom without shoes on. Bathrooms are restocked for toilet paper or paper towels and given a spray of Lysol between trips, but they aren’t thoroughly cleaned or sanitized after each flight. That mysterious liquid on the ground is probably not water or cleaning spray. Actually, you should keep your shoes on whenever possible. Thousands of people have walked through the plane and you don’t know what they’ve stepped in. If someone gets sick on the plane, a cleaning crew comes in, but they don’t clean the entire carpet—just the problem area. 4. Flight attendants life-hack everyday objects in the air. If you ever find a coffee bag in the bathroom, it’s not there by accident. Flight attendants use the grounds to absorb the smell and make the bathrooms a little less horrible. They use this trick if someone vomits too. They’ll also use vodka or gin to sanitize surfaces and their hands, since planes don't have a lot of cleaning supplies. 5. You might not be told the real reason your flight is delayed or cancelled. Bad weather anywhere along your route—not just where you’re flying to and from—can cause delays. Flights are also required to have a minimum number of crew members present to fly. Due to delays on other flights, flight attendants might be unable to make another flight they were scheduled for later, or they might have reached the limit of the number of hours they can legally work in a day, which is 16 hours. 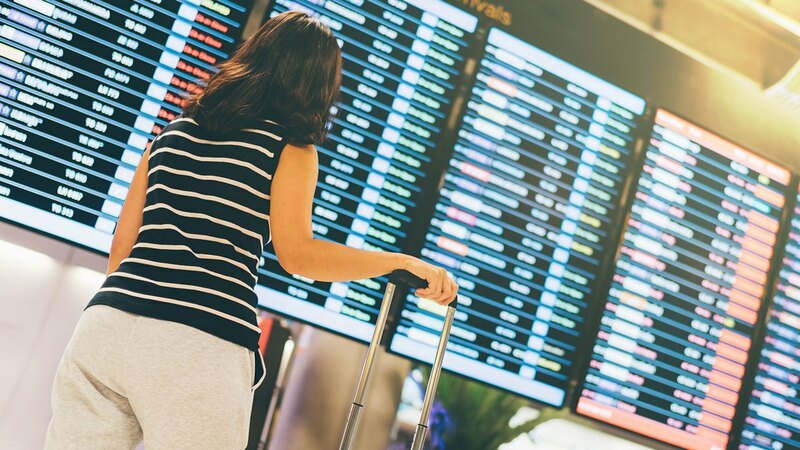 To prevent a complete domino effect, there are flight attendants scheduled on “standby,” which means they are scheduled to sit at an airport and can be called to work a flight if needed. But if there still aren’t enough, your flight could be canceled. More rarely, delays can be due to terror threats or safety issues. For example, there could be a threat called in on planes departing a specific country, and until the threat is under control or debunked, flights will be delayed or canceled. The airline may just tell passengers the plane is experiencing mechanical issues in order to prevent unnecessary panic. 6. Flight attendants sleep in secret rest bunks in larger planes. Flight attendants are required to take a certain numbers of breaks on flights longer than six hours, and on larger planes used for international travel, there’s a door that leads to a secret room with bunks for flight attendants to rest on their breaks. The door itself is usually hiding in plain sight when you board the plane, but it requires a key to get in. 7. It’s against airline rules to take pictures or video of airline personnel or the plane’s interior. While the specific rules vary between airlines, it’s a matter of safety. Anything you put out on social media can be used to gather information about the setup of an airline or the uniform of the flight attendants. 8. Airplane food is actually really, really bad for you. While airplane food never had the greatest reputation to begin with, it’s doesn’t just taste bad—it’s unhealthy. Because of an airplane’s elevation, your taste buds actually become numb to certain flavors and food tastes more bland. To combat that, extra sodium and sugar is added to the food to give it more flavor. If you don’t want to leave the flight bloated and dehydrated, try to eat before your flight if possible, or bring your own food. 9. Flight attendants are extremely prepared in case of a medical emergency but there’s a limit to what they can do. Flight attendants are trained to be able to use the first-aid kits and EpiPens that come equipped with the plane, in addition to knowing CPR and the Heimlich maneuver. But for more serious incidents—and to use certain medical equipment on the plane—they have to locate a doctor on board. In the event that there’s no doctor on the flight, there’s actually a number to call that connects through a Wi-Fi connection to an on-call doctor to provide assistance until the flight can divert to get that person to a hospital. If the flight is flying over the ocean and there’s no place to divert, flight attendants have to treat the passenger to the best of their ability, either alongside an on-board doctor or with assistance from the ground. Flight attendants also cannot legally pronounce someone dead—only a licensed medical professional can do that. So unless there is a doctor on board, a passenger is still “alive” until they reach the ground. While in-flight deaths don’t happen frequently, flight attendants do have to deal with the body if that happens. They try not to move the body, instead reseating passengers to other empty seats on the plane and covering the body with a sheet. If there aren’t any empty seats, those passengers unfortunately have to stay next to the body until the plane lands. 10. Turbulence can be incredibly dangerous if you’re inside the plane but it’s nearly impossible for it to bring down the plane. There’s a reason flight attendants recommend you wear your seatbelt as much as possible during a flight, even if the seatbelt sign is off. Even on a clear, sunny day, turbulence can come out of nowhere. If you’re not sitting with your seatbelt on, bad turbulence can cause you to hit the ceiling or wall, resulting in broken bones or worse. But while turbulence can feel scary, it’s not going to bring down the plane. Airplanes are designed to withstand extreme turbulence and the wings of an airplane can actually bend up to 90 degrees.